A number of themes were emphasized in household decoration, but priority was given to the theme of prosperity. One of Florence’s principal monuments was the colossal statue (the original is lost, replaced by a later version) of Dovizia—Abundance—by the preeminent sculptor Donatello. (The name “Dovizia” is an Italianization of the Latin divitiae, prosperity or wealth.) Commissioned by the Commune (municipality) c. 1430, Dovizia was set up in the main marketplace of Florence. Replicas in the form of small statuettes were used in household display, adding the emblem of the city’s prosperity to the private home. 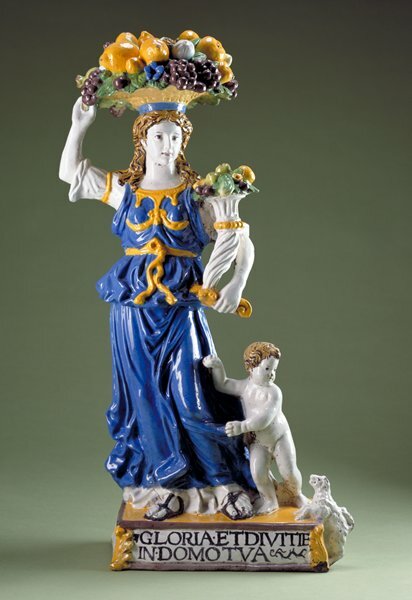 Giovanni della Robbia’s small-scale version of this statue conveys the message of household prosperity through the figure’s richly flowing gown, the lush basket of fruits and vegetables balanced on her head, and the cornucopia brimming with fruits and vegetables held in her hand. A small naked boy or putto, investing the figure with the attribute of earthly charity, clings to her skirts, and a small white dog, signifying fidelity, clambers onto the pedestal. The message of prosperity and abundance is made explicit by the inscription on the statuette’s base: GLORIA ET DIVITIE IN DOMO TVA (Let there be glory and riches in your house). Strategically placed for easy viewing inside the home, these statuettes carried a complex message that linked domestic well-being and dynastic continuity to Christian virtues and the prosperity of the city. One inventory tells of such a statue, placed on a gilded base, standing prominently in the principal room of the ground floor of a palace to announce its message of prosperity to family and visitors on entering.